Blake Barnes walked out of Common Market, the beer shop and deli he owns in Plaza Midwood, on the morning of May 31 and saw a multitude of TV cameras aimed at a man in a police uniform preparing to address the press. The scene was reminiscent of what happens following a murder or other high-profile crime, something Plaza Midwood had dealt with late in 2016 and had no interest in seeing again. But there was no bad news in the neighborhood to be reported that day. The CMPD was announcing the launch of new "walking beats" in Plaza Midwood and NoDa. Beginning that night, three officers — the same three each night — would walk the streets of NoDa and Plaza Midwood between 6 p.m. and 4 a.m. Wednesday through Sunday. CMPD increased patrols in Plaza Midwood in january after a string of high-profile crimes. The announcement was a welcome one for Barnes and other area business owners, who hadn't known about the roll out of these new beats until that morning. For others, the news didn't sit so well. As TV news stations broadcast the story throughout the day, community leaders in other parts of the city wondered why resources were being pushed to these particular parts of town. The announcement came on the heels of a bloody Memorial Day weekend that saw murders occur in Rozzelles Ferry and Sugar Creek road corridors, both long troubled areas. CMPD spokesperson Rob Tufano said the new walking beats are in no way related to a rise in violent crime throughout Charlotte this year — during which the murder rate has nearly doubled — but have been in CMPD's plans for some time. The recent budget proposed by city manager Marcus Jones includes money to hire 62 more officers over the next year, and Tufano said this investment allowed CMPD to implement the walking beats. "This gives us the opportunity now to be a little bit more creative and a lot more proactive in the way that we police," Tufano said. Maybe so. But some neighbors say they feel left behind by the department's priorities. Teresa Reid, 68, has been living in the Belmont neighborhood between NoDa and Plaza Midwood for 23 years. Reid said that when she moved to Belmont in 1994, police would walk the neighborhood on a daily basis, but shortly thereafter, the walking patrols stopped. As a board member in charge of community engagement on the Belmont Community Association for many years, Reid said she continuously asked for CMPD to resume such tactics. "They do come around and they get involved, like if I called them I get a good response out of them, I really do, but it's just that sometimes they're not as visual as they used to be," Reid said. "They get a situation done and that's it, we don't see them anymore for a while. It's probably because they'll be going over to another neighborhood. If they stay more visible and vigilant, we wouldn't have as much problems as we do, with [people] hanging on the corners and selling drugs." Reid said residents discussed the need for more police engagement at their monthly neighborhood meeting in May, before they were aware that police would be walking the neighborhoods to the north and east of them within a matter of days. "I would love for them to spread it around a little more," Reid said. "I do hope they're including us in with that." Police won't be stretching their walking beats to Belmont this summer, however. Tufano said he is unsure of any imminent plans to expand the walking beats, but pointed out that the program was piloted in the troubled Beatties Ford Road corridor in 2016. Mayor Pro Tem and 2017 mayoral candidate Vi Lyles expressed similar concerns with CMPD's priorities when she heard the news on May 31. She took to Twitter: "While I'm encouraged by this initiative, it does raise questions. There are other neighborhoods where we need to build relationships [with] CMPD." Liles later told Creative Loafing that she had a phone discussion with CMPD Chief Kerr Putney, who told her that the department's plan was to continue expanding walking beats in needed spots throughout the city as police analyzed results from the Beatties Ford, Plaza Midwood and NoDa walking beats. "As more of these opportunities are presented by the community and that increases the level of security and safety — both perceived and real — that will be an important thing for us to do," Lyles said. "The whole thing right now in Charlotte is to feel that safety, and that's not just about policing; it's a lot about traffic calming, it's a lot about getting some geography for biking and walking, anything to get people out on the streets. So that's what I think is really important, that we're trying." For some, however, the walking beats leave a sour taste regardless of any promises of future expansion. 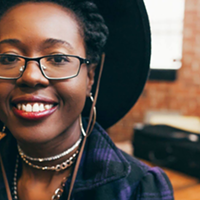 When amalia deloney (who does not capitalize her name) first saw the story about walking beats on television, she was struck by how openly the police admitted the choice was about protecting "entertainment districts." A resident of Seversville in west Charlotte, deloney said the decision to put foot officers in Plaza Midwood and NoDa is indicative of how choices are made throughout the city. "I think the first thing it struck me as is that the deployment of these police in these two neighborhoods isn't actually about protecting the people in the neighborhood, it's about protecting the financial benefits that will come to this city from the money spent in that area," deloney said. "So let's dispel with the myth that this is about the people of NoDa or Optimist Park or Belmont or Plaza. It's about the dollars that the establishments are generating that go into the city. "What it means is that areas that are part of the city of Charlotte that are not seen as revenue generators get substandard treatment in all areas of the deployment of city resources: substandard schools, substandard sidewalks, substandard lighting, all of it. This is what it looks like to be in a city in the 21st century where everything is absolutely based on capital and the places that are seen as generating more wealth for the city are treated better and they're treated differently. " In January, CMPD launched "Operation Avalanche" in response to the rise in violent crime during the first days of 2017. The department flooded four parts of the city with police in patrol cars, making nearly 80 arrests in the first three weeks of the operation. Tufano said that, although details are not yet available, CMPD is currently discussing a summer operation to fight back against violent crime that could look similar to one implemented a few years ago in which rolling units are deployed not to a specific division but to spots in the city where crime has spiked within recent days or weeks. For deloney, the difference in tactics between the operations Tufano spoke of and the new walking beats is the difference between aggression and truly protecting and serving. "No, we get an authoritarian, heavy-handed, 'I am the hammer, you are the nail,' policing, and 'You are a problem and I'm here to catch you doing something I assume you're already doing,'" deloney added. 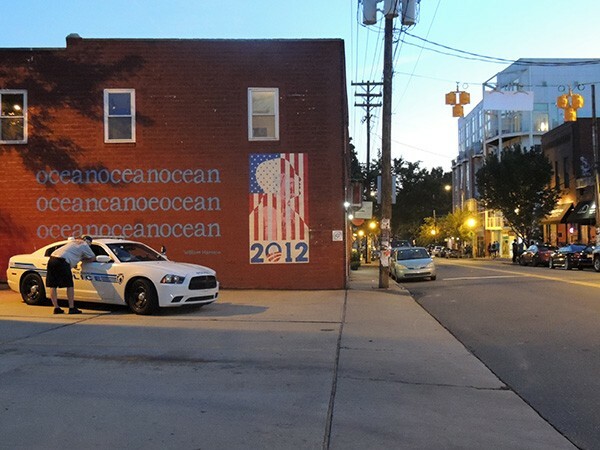 A police car hangs out in NoDa on May 31, the first night of foot patrols in the neighborhood. Later on May 31, as the sun set on North Davidson Street a little after 8 p.m., it looked like any other spring night in NoDa. A police car was parked in front of the fire department near the middle of the neighborhood, but that is a common enough sight. A firefighter was leaning into the cruiser window, chatting up the two officers in the car. But soon the two officers would do something not so ordinary: they'd get out and patrol the NoDa streets. The act seemed simple enough, common in urban neighborhoods throughout the country, but it was the first scheduled foot patrols in NoDa since before it was even known as NoDa. Scott Lindsley, co-owner of NoDa Company Store, heard about the foot patrols on social media and welcomed the news. The Company Store closes earlier than many other bars in the area, and it faces a street with less traffic than the busy North Davidson Street just a block over. Last summer, Company Store was among a string of businesses burglarized late at night by one or more suspects who had been smashing through windows and breaking into businesses along the popular strip of bars and businesses. Recently, the store was burglarized again, once in March and again in April. Before moving to NoDa with his husband, Company Store co-owner Joey Hewell, the two lived in South End, where Lindsley said they had a "neighborhood police officer" who would ride a Segway around and was familiar with most nearby residents and business owners. He believes having three officers consistently walking around NoDa will be a help to business owners. "I don't have any kind of false hope that it will solve all the problems, but in my experience those officers get to know the neighborhood and the people and because they're not just driving through in a car, they recognize things that are unusual or unfamiliar," Lindsley said. "I actually think community policing is probably one of the best things they can do." Just a couple miles away in Plaza Midwood, some residents and visitors are still antsy about a particularly violent end to 2016, during which a number of high-profile crimes included the murder of Katherine Jones in October — for which no arrest has yet been made — and the shooting of Bruce and Joanne Parker on December 16. 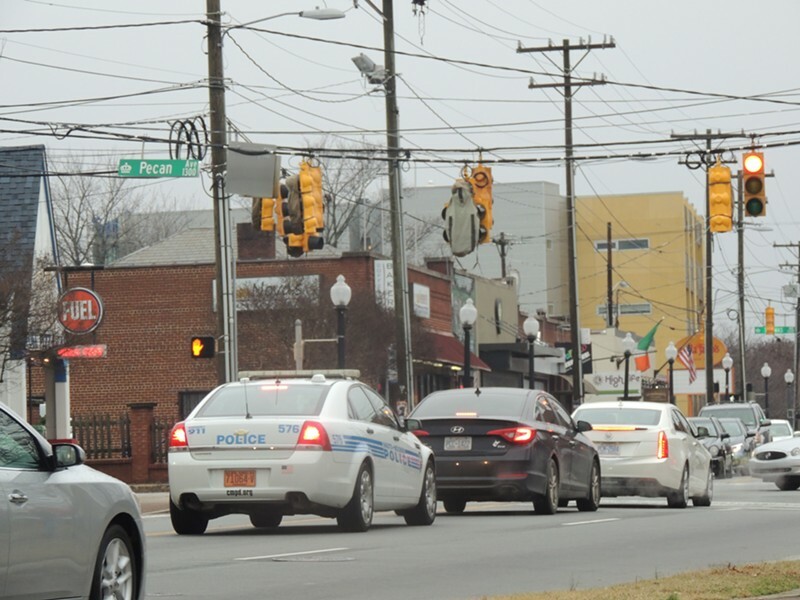 CMPD responded by boosting patrols in the area, and violent crime has dropped in the neighborhood since — just one violent crime, a sexual assault, was reported in the Plaza Midwood area between Jan. 28 and May 31 of this year, according to CMPD. Barnes said he's noticed a drop in violent behavior in the neighborhood lately, but remains overwhelmed by the sheer number of people patronizing his business. "I've been here 15 years, and I've really had to adjust over the last couple years with all these apartments," Barnes said, referring to the thousands of new condos and apartments that have popped up in the area recently. "I've had to deal with the volume of human beings — and I'm not complaining, it's awesome — but I've got all these people who are not from the neighborhood coming in. We welcome all that, but it's just like, wow." A coalition of Plaza Midwood business owners has already been paying off-duty police officers to set up on Thomas Avenue in front of Thomas Street Tavern, and Barnes pays an off-duty officer to hang out at his store, as well. 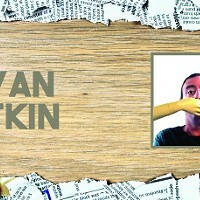 The influx of people has brought what could only be referred to as an influx of sketchy behavior. Barnes said he's seen an increase in shoplifting in his store, car break-ins outside of his store and some other bizarre crime, as well. "We've got a lot more people, I wouldn't say they're homeless, but people who are just hanging out. They don't really spend anything, you don't know what they're up to. I have noticed an uptick in that," Barnes says. "With me you're not paying a cover to get in, people are on and off my patio all the time, which is why I'm keeping an off-duty guy at my place because it's so hard. They'll sit there and next thing you know they're drinking somebody else's beer when they set it down — all kinds of weird stuff like that. When you get a large mass of human beings like that, they've got to prey on everybody." Barnes said he will continue to pay the officer to watch over his shop, and he knows the Thomas Avenue contingent will remain as well, at least until local business owners become familiar with the three officers assigned to the Plaza Midwood walking beat. "The outfit in front of Thomas Street, if there's any issue, we have their cellphones and we call them and, bam, they're right where they need to be," Barnes said. "With the walking thing, I don't know. Are they going to be around me? Who knows where they're going to be?" One thing is for sure — whether on foot or in patrol cars, whether readily welcomed or not so much — they'll be around.